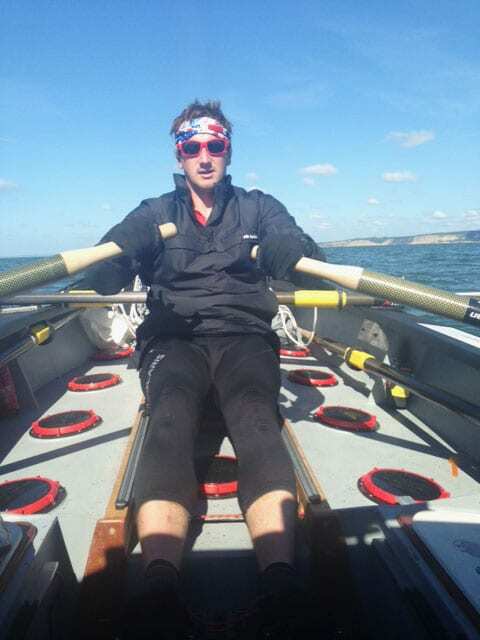 We had a little play with a lee shore on the last bend of the Thames, the rudder got stuck a few times in the soft mud but we managed to free it each time by rowing backwards into the wind (with a stuck rudder that’s exhausting). 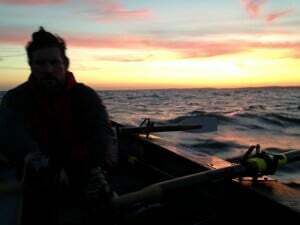 It was slow progress but we found the wind eased off and the first night on the oars was quite nice! I hit a few crab pot flags with the oars (with no warning), made me jump! We also had a seal following the boat for 45 mins. The following morning we made use of the AIS, we got an alert, looked around and could see a big freight ship “Dresden” heading more or less for us!! We could see the shipping lane markers and stayed just inside them. The ship continued past, it’s wake was about 4ft or so and shook us around! Around Margate was nice, we had people coming over on boats asking about what we’re doing and tempting us with cups of tea! We didn’t have anything…We cruised down towards Dover, asked the Dover Port Control for permission to cross the gates, they were really friendly and let us through after a MASSIVE ferry left not too far in front of us. Making the best of the tide we pushed on until we couldn’t fight it anymore and anchored at Folkestone to get ready for Dungeoness headland up ahead. As the tide turned we went for it, cleared the headland and powered on through to Beachy Head, where we had a building swell and strong winds roughly in our direction! Beachy Head was tricky, the wind and swell wanted to push us into the headland so we needed to go almost beam onto the wave (some starting to break) and steer with the breakers in order to get far enough out that we could then change bearing and cruise past the headland with the waves 🙂 as we passed the headland we saw a lone yachtsman throwing his yacht around as if he was out of control in the big waves! Turns out it was a friend of ours that we met in Plymouth when doing a first aid course! A few words exchanged, he set off and is following us online now! We also saw a small dark dolphin, I’m still yet to know what type it was? On to the Isle of Wight! We didn’t quite make it in time with the tide, so slowly pushed to get into Sandown for some shelter before the tide changed. Tide changed and we set off for a long night. We got past St Katherine’s (headland of IOW) and set bearing for Start Point (home). We’re settled into shifts, one and a half hours on and off. On our course, I noticed two boats on the GPS and managed to head dead between them, pointing into our course as if waiting to ambush! As we crossed, an alert came up warning of a collision but by that time I could see where they were and roughly where they were headed.. Safe! A little disconcerting when you can only see nav lights. There’s very little to tell you distance or scale of the boat. Shift change and Jason’s turn to find some boats. He found more than I did! I poked my head out after another alert from the AIS. Jason said, “it’s like the M25”. Looking all around us there were boats, then we noticed one heading straight for us, fairly quiet and eerie. Turns out it was one of the Volvo Ocean race fleet flying through with the spinnaker up. We shone our flashlight at them to get their attention, we heard a voice and they immediately changed course, phew! Right after that, the rest of the fleet flew through!! It was pretty quiet after that. Today, we continue to push onto start point, as we’ve only got one on the oars at a time we can’t fight the tide so we’re using the six-hour tidal windows to make progress – 24 miles in our first window, hopefully a similar amount at 10pm tonight until 4am. We were surprised to find out from friends and family we were quicker than some of the fours and we’re also surprised to not be so far from Pure Gym, I’m sure they’ll continue to pull away but we’re very happy with our progress so far! We’ve been in touch with the Coast Girls and already planning a beer at the end 🙂 hopefully things will get easier and best of luck to them as the only other pair! !